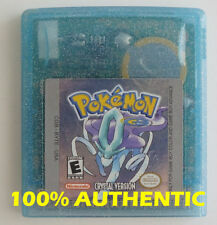 Auction is for a Brand New Factory Sealed copy of Pokemon Crystal Version for the Game Boy Color. Game has been encapsulated inside a tamperproof archival display case by VGA. VGA has awarded this game a grade of 85 Silver. PayPal only. Condition is Brand New. Shipped with USPS First Class Package. All saves have been verified. 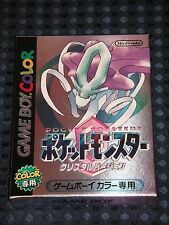 Pokemon Crystal Version Nintendo Game Boy Color 2001 Trainers Guide Manual Only. Condition is Good. Shipped with USPS First Class Package. Good working condition - does not save. Japanese version. See photos for details on condition. Very hard to find!! Will ship in a box protector as seen in the last photo. POKEMON RED BLUE YELLOW GOLD SILVER CRYSTAL NINTENDO GAMEBOY GBA -NEW BATTERIES! A great lot for any collector! All tested and installed with new batteries! Only one owner! Still has all my original data on it. Works perfect. The most notable feature is the selectable female trainer who has her own set of animations and backgrounds. Rival trainers' phone calls are now more plentiful and pragmatic. Lastly, seeing a Pokémon's new animation makes encountering new creatures more fun than before. The battery is new and is set with resistant tape. The pins have been cleaned, so it works properly. Pokemon: Crystal Version for Game Boy Color. Authentic and Tested. Condition is Very Good. Shipped with USPS First Class Package. This is Pokémon Crystal version for GameBoy Color. The game was found in storage. It does not have a new battery. This is an authentic cartridge. Pokemon: Crystal Version GBC GBA(Nintendo Game Boy Color, 2001) SAVES & TESTED! SAVES & TESTED. I only accept. Yellow Version. Blue Version. Silver Version. Red Version. Up for bid is a Pokemon: Crystal Version for Nintendo Game Boy Color. It has been tested and works and saves. However I did not put a new battery in so i won’t guarantee how long the battery will last so this will be sold as is. If you have any questions please contact me. May show signs of wear but have been cleaned and tested and is in good working order! Need new battery! I ALWAYS RESPOND WITHIN 24 HOURS OR SOONER! Pokemon Crystal Version Game Boy Color Cleaned & New Save Battery Nice! 4.5 out of 5 stars - Pokemon Crystal Version Game Boy Color Cleaned & New Save Battery Nice! 247 product ratings247 product ratings - Pokemon Crystal Version Game Boy Color Cleaned & New Save Battery Nice! This is the. TESTED and shown working in the pictures. This may not work with other regions systems. We are not responisble for custom fees. The front and back cover do show signs of use (see photos 11 and 12). It is generally in Good - Very Good Condition. The save function has also been tested and is working. Instruction Booklet 7/10. Selling Pokemon Crystal for Game Boy Color. Game is in good used condition as shown in the pictures. I have recently tested it and did not note any issues Sale includes the game cartridge only Please drop me a direct message in case you have any questions. Pokemon crystal Edition / Crystal Version. Language is English. Pattern picture! Item may differ from the photo. Simple tricks Soak cotton swabs in cleaning alcohol (isopropyl alcohol). The Konsolenkost-Team wishes you a lot of fun.